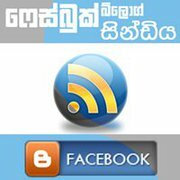 This entry was posted by Sanjaya on April 13, 2010 at 12:51 pm, and is filed under සිංහල. Follow any responses to this post through RSS 2.0.You can leave a response or trackback from your own site. කැවුම් ගෙඩිය තියෙන තැන නම් කින්න ඕන නෑ දැන් අනෙක දැන් ඒක දැගත්තා කියලා වැඩකුත් නෑ නේ………. බොහොම ස්තුතියි. ඔබටත් සුභ නව වසරක් වේවා! දැන් කැවුම බඩේ වෙන්න ඇතිනේ….. නේද? නැත්තම් අටපට්ටමට දාගෙන සංජයගේ මූණත් ඒ එක්කම TV එකට ඔබාගන්න තිබුණා….